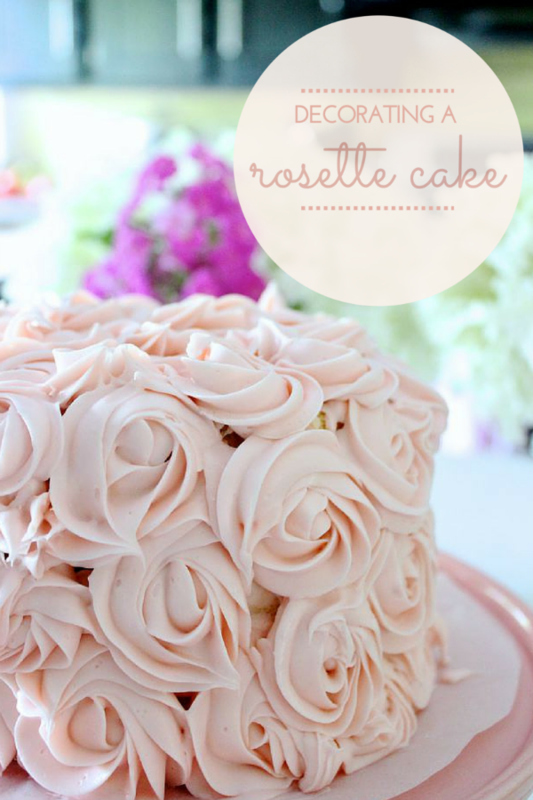 I'd be lying if I didn't say the thought of icing a cake in rosette style icing made me a little apprehensive! After watching numerous YouTube videos, I came across this one and just decided to go to town. I made the cake as a "smash cake". I know --it's hard to believe, making a cake this pretty to only be devoured by a one year old! But it was definitely worth it to see all the babes face dive into the icing! The video will help you master the technique, and learn how to hold the piping bag, (I still have a lot to improve on) but here are a few tips of my own to help you complete your first attempt of rosette style icing. I promise it's not as hard as it looks! Once you get the hang of positioning your hand a certain way, it just kind of flows! Try it out and see for yourself -- but if there's one thing you take away from this post, it's avoid icing the cake on the hottest day of the year! I started off with 3 baked 4" cakes which I made a day prior to icing so that the cake would have proper cooling time. You can use your favourite cake recipe, or to save time, use a boxed cake mix. Make a lot of icing. I iced in between the cake layers, as well as all around the cake. So at the least double your recipe to ensure you will have enough. I did not do a crumb layer. If you do decide to coat the crumbs you will need more icing. I used the 1M Wilton piping tip to get the proper rosette swirl. Chill the icing before you start on the cake. Unfortunately I iced my cake on probably one of the hottest days of the summer and found the icing sliding down the sides. Next time I would stiffen the icing more by adding more icing sugar. I also put the cake in the freezer in between the rose layers. This helped to keep the icing cool. Put the iced cake in the fridge or freezer right away to set. Don't stress out if your rosettes are not perfect! I totally was freaking out at some points, but somehow it looked presentable in the end. If you really dislike one of the rosettes, just wipe it off and start again! This would be the perfect focal point for a sweet table, don't you think? I am envious of your decorating skills! You did a great job on this beautiful cake! I think I found my baker for my birthday cake. This is so beautiful! I'd think you have made them before! So much work for a smash cake though. I bet it made for such cute photos. Aww thank you, Christine! Yes- the pics are worth a thousand words!